At this morning’s event, Google announced two new Chromecast devices, an updated Chromecast HDMI dongle for your HDTV, and a Chromecast Audio dongle, capable of turning any regular speaker into a smart speaker. 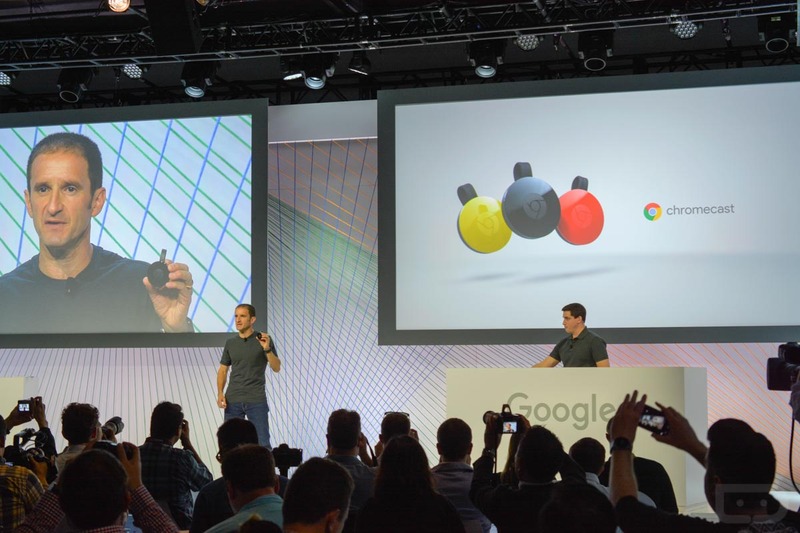 The updated Chromecast dongle features a retooled design, allowing for easier plugging into television units. Essentially, it acts the same as the older Chromecast, albeit with updated features, but the hardware inside the unit has changed most. Inside, we have dual-band WiFi, with a smart connection that allows for the fastest WiFi connection, all of the time. Google decided to price the Chromecast dongle the same at $35, available for purchase today. Chromecast Audio is basically the same thing, but for music. Instead of hooking it up to a TV, you hook it up to a sound system or Bluetooth speaker. This allows you to save battery on your smartphone. You and friends can set a queue of music for a playlist, and the hardware even allows for multi room support. Chromecast Audio is also priced at $35. To use these devices, Google is releasing an updated Chrome app, bringing a gang of new software features for this updated hardware, as well as the same content for 1st Gen Chromecast owners. Be on the lookout for this to hit Google Play soon. More info and exact specs can be found on their respective product listings through Google Store. Update: The updated Chromecast app is now available on Google Store. Download here.